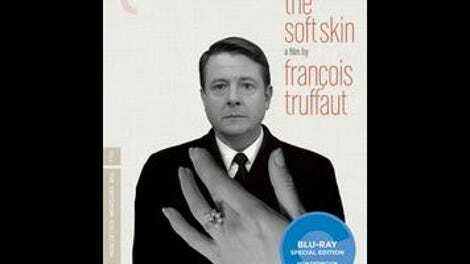 After kicking off his filmmaking career with three consensus masterpieces—The 400 Blows, Shoot The Piano Player, and Jules And Jim—François Truffaut finally whiffed with his fourth feature, The Soft Skin, which chronicles the adulterous affair between a celebrated academic and a much younger flight attendant. That’s the historical narrative, anyway. It didn’t help that The Soft Skin premiered at the 1964 Cannes Film Festival, where The Umbrellas Of Cherbourg won the Palme D’Or; Cherbourg starred Catherine Deneuve, while The Soft Skin was among the first big vehicles (along with That Man From Rio) for Deneuve’s older sister, Françoise Dorléac. Comparing the two sad romances was inevitable, and Truffaut’s film suffered as a result. Only much later did its reputation rebound somewhat, as various critics—and now Criterion, which adds it to their esteemed collection this week—made a case for it as a misunderstood triumph. As usual, the truth lies somewhere between those two extremes. The Soft Skin was Truffaut’s attempt at a Hitchcockian thriller, but he couldn’t quite bring himself to embrace a typical Hitchcock plot. Instead, he devised a rather tawdry scenario that would ordinarily merit a naturalistic approach, then imposed elements of suspense onto it. While visiting Lisbon to deliver a lecture, famed scholar Pierre Lachenay (Jean Desailly) has a fling with flight attendant Nicole (Dorléac), who impulsively gives him her phone number. (This is a French film, so middle-aged dudes who write about Balzac are like rock stars.) Back in Paris, Pierre calls her, and they continue seeing each other, with Pierre agreeing to speaking engagements in far-flung locations expressly in order to rendezvous with Nicole. Eventually, he decides to leave his wife, Franca (Nelly Benedetti), though he lies to her when she asks if there’s another woman involved. This leads to a tense finale in which Pierre attempts to dig himself out of the ruins he’s made of his life, unaware that one of his two lovers is busy loading a shotgun with shells that have his name on them. Viewed as a genre experiment, The Soft Skin doesn’t really work. Truffaut directs it like a thriller from start to finish—the opening sequence treats Pierre’s concern about missing his flight to Lisbon as if he’s a secret agent in danger of jeopardizing the country’s security—yet the climactic threat of violence still feels like it arrives out of nowhere, reeking of artistic desperation. And without that fillip, there’s not a whole lot to the story, which is a fairly standard-issue infidelity melodrama. Desailly plays Pierre as an ineffectual dweeb, and Nicole’s passion for him seems predicated mostly on his celebrity status (which, again, plays as bizarre by contemporary American standards—he’s mobbed by photographers when he gets off the plane, en route to his Balzac lecture). We’ve seen movie characters make these kinds of self-destructive choices many times before, in contexts that don’t require the sudden appearance of a shotgun to feel urgent. At the same time, though, Truffaut’s natural penchant for lyricism keeps asserting itself in arresting ways. When Nicole agrees to meet Pierre for coffee (after initially turning him down), he’s so giddy that he walks around his hotel room turning on all the lights; the camera follows him rapturously. Likewise, it’s remarkably touching when Nicole furtively grabs a dress from her suitcase at a gas station, leaning over into the back seat while keeping an eye on Pierre to make sure he’s not looking—he expressed mild disappointment that she was wearing blue jeans, and she wants to surprise him by changing unannounced. (Yes, the gender roles are archaic.) Best of all is an extended mid-film sequence set in the sleepy town of Reims, where Pierre has taken Nicole for a weekend getaway; he has to introduce a film, though, and afterward finds it impossible to get rid of his starstruck hosts, leaving poor Nicole alone to be harassed by some random guy on the street. The compositions, with Pierre sitting in a café peering anxiously over his companion’s shoulder at Nicole fending off advances across the street, demonstrate just how much Truffaut learned from Hitchcock (whom he’d soon interview for his seminal book Hitchcock/Truffaut). A great Truffaut thriller would have to wait until Mississippi Mermaid, five years later (starring Deneuve—by that time, Dorléac had died in a car accident), but the seeds are planted here.